In this free eCookbook, Easy Thanksgiving Recipes: 8 Restaurant Side Dishes for Thanksgiving, you'll find your favorite side dishes from your favorite restaurants. These super easy restaurant recipes will help make your next Thanksgiving holiday the best one ever. These Thanksgiving side dish recipes are sure to help you add a little something extra special to your holiday this year. Since these copycat recipes come from your favorite restaurants, you know these side dishes will impress. Everyone at your Thanksgiving dinner is sure to go crazy for all of these recipes for side dishes. Easy Thanksgiving Recipes: 8 Restaurant Side Dishes for Thanksgiving today! Thanksgiving is one of the most popular holidays for enjoying great food. Certain iconic recipes come to mind when thinking about the Thanksgiving holiday. While turkey may be the main attraction for some people, the side dishes are just as important. Classic side dish recipes for green beans and sweet potatoes are a must for the Thanksgiving menu. Of course, the more side dishes you serve the better! With this eCookbook you can make an amazing Thanksgiving meal without spending the entire holiday in the kitchen slaving away. In this amazing, free eCookbook, Easy Thanksgiving Recipes: 8 Restaurant Side Dishes for Thanksgiving, you’ll discover sensational side dishes from all your favorite restaurants, including Boston Market, Ruth’s Chris, and Cracker Barrel. Inside you will find vegetable side dish recipes like Copycat Cracker Barrel Green Beans (pg. 6) and Homemade Candied Carrot Stix (pg. 13). You will also find easy casserole recipes like Copycat Ruth’s Chris Sweet Potato Casserole (pg. 5) and Homemade Boston Market Squash Casserole (pg. 9). We even included dinner roll recipes and cornbread recipes! These recipes will mean a restaurant quality meal on the table this Thanksgiving. Once your family tastes this year’s side dishes, they will be hounding you for the easy side dish recipes. For more fun and easy copycat recipes, be sure to visit AllFreeCopycatRecipes.com. While you’re there, subscribe to AllFreeCopycatRecipes’ free Crazy for Copycats newsletters to get free recipes delivered to your inbox every week. 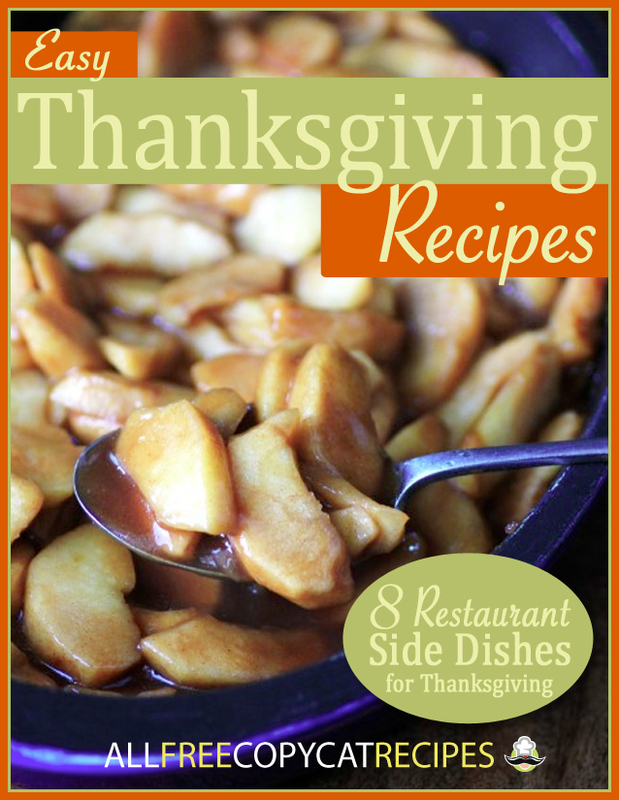 Download your free copy of Easy Thanksgiving Recipes: 8 Restaurant Side Dishes for Thanksgiving today! 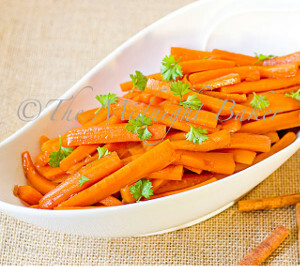 Vegetable side dish recipes for Thanksgiving dinner are a must. These homemade side dishes add another important element to the classic Thanksfiving meal. Casserole recipes are great side dish recipes for Thanksgiving because they are so simple to make and serve to a large crowd. You can't have a Thankgiving dinner without a little bread on the side. These bread recipes are easy to follow even if you don't cook often. 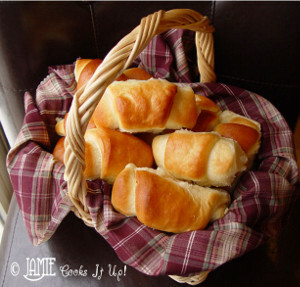 Make Thanksgiving dinner the best ever with homemade bread and rolls! Need Help Downloading This eCookbook? If you enjoyed this free eCookbook, you won't want to miss any of our other downloadable recipe collections. We have printable guides for all types of recipes. You can browse our entire library of free eCookbooks here. For the best side dishes this Thanksgiving, be sure to download this amazing eCookbook filled with easy to make and delicious side dish recipes. You don't have to get too fancy with these amazing recipes; they are super easy and extra flavorful without being really challenging to make. Bring the taste of your favorite restuarant into your own kitchen with this great collection.